Two weeks after holding off the Bulldogs at home by a score of 83-79, Alabama (15-8, 6-4, KenPom: 46; NET: 43) will travel to Starkville for their second game with Mississippi State (16-7, 4-6, KenPom: 26; NET: 29). As of Sunday afternoon, tickets were still available for this game for those of you interested in attending. Game time on Tuesday is 8:00 P.M. CT. The game will be televised on the SEC Network. My Two Cents: Alabama had a great week, finishing 2-0 vs Georgia and at Vanderbilt. Obviously, all wins are important, but taking care of business against two teams in the bottom of the league standings had an ounce more of importance because of what losses to those two teams would have meant to the postseason resume. And of course, winning at Vanderbilt, after all of the struggles there we've witnessed, had some extra sauce to it. Alabama is now 6-4 in league play, and very much in the conversation for the 4 seed in the league tournament, and the bye that goes with it. If you've been reading this blog long enough, you've likely seen one of the writers or someone posting a comment write that the upcoming game is a must-win for Alabama. You've likely even seen it this year. For a change, at least for this week, the shoe will be on the other foot on Tuesday night. A win for Alabama would be huge, of course, but this game arguably means more for Mississippi State. The Bulldogs will enter this game with a 4-6 record in league play. They've lost two straight and three of their last four. This State roster is talented, and I believe they will ultimately be in the NCAA Tournament; but if they lose on Tuesday night, they'll fall to 4-7 in league play. If that happens, the word "bubble" will start being used more frequently when discussing the Bulldogs. Not much has changed stats-wise for State over the last two weeks from the first preview I posted. They remain a talented offensive team, currently ranked 3rd in the conference in effective field goal pct, 4th in offensive rebounding pct (they had 19 offensive boards in the first meeting in Tuscaloosa), and 2nd in 2-pt pct. Their numbers have slipped a little where it concerns overall efficiency (ranked 7th in the league), free throw rate (8th), and 3-point pct (6th). The two areas that have been the biggest weakness so far has been turnover pct (currently ranked 10th), and free throw pct (also ranked 10th). If you recall, State had a terrible night at the free throw line in the last game vs Bama (12-22), which was a determining factor in the outcome. It's been on the defensive end where State has really struggled. Aside from their block and steal percentages (ranked 2nd in the league in both categories) they're ranked average to bad in the conference in other important categories such as defensive efficiency (11th), opponent effective fg pct (9th), turnover pct (9th), free throw rate (8th), 2-pct pct (7th) and 3-pt pct (13th). Mississippi State is one of the most talented teams in the league, but if they're not going to guard anyone consistently, they're going to fall short of their ceiling. Players to Watch: Kira Lewis continues to amaze in his freshman season, and Saturday was no exception. 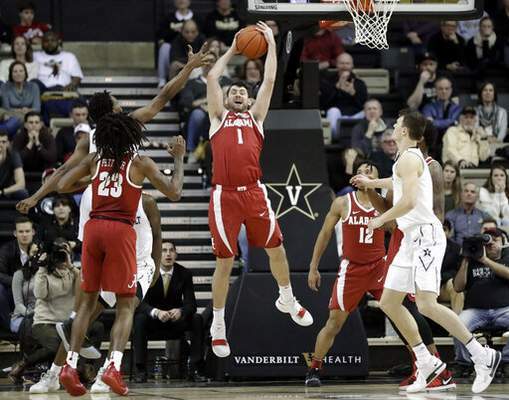 While he did get bogged down a little late in the second half, along with the rest of the team, for the majority of the evening it appeared that the Vanderbilt players had no idea how to deal with him. He routinely got to any spot on the floor he wanted to get to with little resistance. It was a similar occurrence in the game vs Georgia earlier in the week. If Mississippi State wants to avoid the season sweep, they better find a way to limit Kira's impact on this game. Quinndary Weatherspoon is nearing the end of a great four-year career in Starkville. He's certainly been great for the Bulldogs this season, averaging 17.9 pts, 5.5 rebs, 2.5 assts and 1.5 stls. He has nine 20+ point games so far this season. Mississippi State is a deep, talented team that doesn't have to rely on Weatherspoon, but I think they're better when his impact is substantial. Prediction: Mississippi State has a solid resume despite their recent struggles (6-4 in quad one games), but they can't coast on what they've done. As I mentioned above, if they lose on Tuesday night, that's a 4-7 mark in conference play. At some point, those losses will start to catch up with their resume and they'll be a legitimate bubble team. For this reason, our guys have to be prepared to see a desperate State team on Tuesday. Coming into this season, I believed Mississippi State was a legitimate conference title contender. That hasn't panned out, but I still believe, when they play at their best, there aren't four better teams in this league. Take that, mix in some home-court advantage, and a little of that aforementioned desperation, and my guess is our guys are going to have to play their best basketball to get out of Starkville with a win. Our guys keep it close, but fall short.